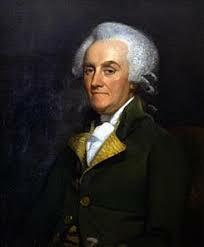 Benjamin Franklin’s son William (known as “The Governor” in some circles, do distinguish him from his son, William Temple Franklin) was imprisoned in New York during the Revolutionary War, and returned to England through an exchange of prisoners. He remarried there (to widow Mary D’Evelin on August 14, 1788) and his days ended there. My Body I desire may be buried with as much frugality as is consistent with decency and should I die in or near London it is my request to be buried in the same grave in St. Pancras Church Yard (if it conveniently may be) in which my late beloved wife was deposited. The wording in this will suggests that the grave of Mary Johnson D’Evelyn may be the exact location of her husband’s. In February 2005, Lady Joan Reid and I found in the English archives the burial record of William Franklin (born 1 September 1731 Philadelphia, died 17 November 1813 London, England), son of Benjamin Franklin. The church is what is now known as the Old St. Pancras Church, which is on Pancras Road behind St. Pancras railway station in London. We went to the cemetery but were not able to find the grave, probably because it was dug up when the railway was expanded in the middle of the 1800s. There were many tomb stones stacked up against a tree inside a fence; William’s may be among them. This report is expanded on Professor Roper’s William Franklin page, with a little more on that disturbance of the churchyard. FindAGrave has entries for the churchyard and for his grave. They are listed in my Virtual Cemetery of Franklinians as well. Another Franklin associate, the transvestite and spy Chevalier d’Eon, is buried in St. Pancras, as well as the pickpocket from the Beggar’s Opera, Jenny Diver. Far from her own people in Barbados, far from her husband’s grave in London, far from the Franklin family tombstone in Philadelphia, she lies buried in St. Paul’s church in New York — all by herself in a strange land, just as she had feared.